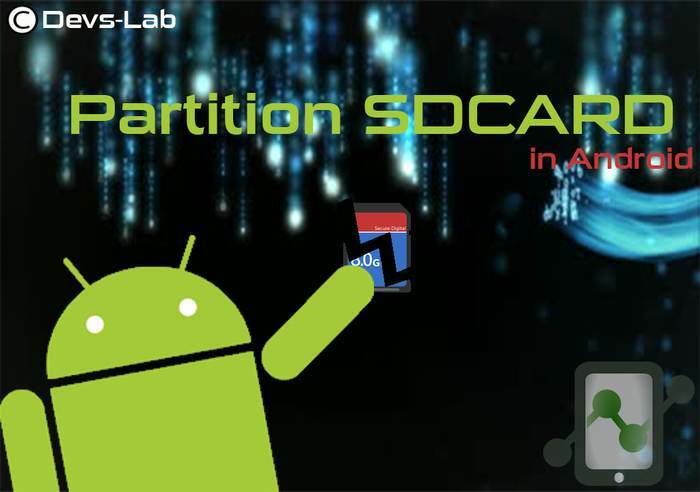 How to Partition SDcard and Increase Internal memory in Android easily. Internal memory of a device plays a major role in device performance & Storage. Few Apps can only be installed in Internal memory which in turn reduces device performance. Most of the low end device user experience this issue. After lot of request for ‘Method for Increasing Internal Memory’ i am writing this post. This might be the easiest & safest method to increase internal memory of your Android Device. Mounts2SD started out as a simple sd-ext script which only difference between it an others like it, was that it did not use symlinks to create links between /data and /sd-ext. To day it has grown to be so much more. It now comes packed with an Application for controlling the script, viewing current states and more. The script itself has grown to become a large storage and management script with features that controlls SWAP, ZRAM, mount optimization, storage thresholds, different external and internal MMC configurations, cache and more. The content management is able to move a lot more different content between /data and /sd-ext, including the new internal storage, which on some devices, is placed in /data/media, and it also contains more than one option for storing system content on both /data and /sd-ext. Disclaimer : I am not responsible if you brick your device or if your device blows up, implodes, flames start shooting from it, or it kills your neighbor’s dog. But i can assure you that it will work if you do the same as i say. Do not forget to take a nandroid backup of ur phone before doing this . If you have already ‘PARTITIONED’ your SDcard into ‘FAT32’ & ‘Ext2’ then Skip Step 1&2. If you have already partitioned your SDcard. But made the second partition of other file type then ‘EXT2’ EG : FAT32 , EXT4 then Skip Step 1. If you are new to Partitioning then Follow each step carefully. Init.d support enabled. Follow this : Enable Initd support on android. Step 1 – To create a SDcard partition with Minitool : In this process your memory card will be formatted. Install Minitool partition on your pc. Copy any data you want from your SDcard to a file/folder in your computer. 3. Launch MiniTool Partition Wizard and wait for the application to recognize and display your drives. 4. Right-click on the heading for your SD card and select “Delete.” Any existing partition on your card and all data stored on the card will be deleted. 5. Now again right click on the sdcard & Click the “Create” button and select “Primary.” in Create as. 6. Select “File System: FAT” if your card’s capacity is less than 2GB; select “File System: FAT32” if the card is 4GB or greater. 10. Click “Apply” when finished. None of the actions described above will occur until you click this button – MiniTool Partition Wizard queues actions to run in sequence instead of processing them when entered. Thats all, after the process finishes you will have two partitions. when you connect your SDcard next time, in ‘My Computer’ it will show the capacity as the first partition. Step 2 : This is for those who have already created a partition but have set their 2nd partition as FAT32 or other but now want to convert them into EXT2 partition. NOTE : In this process your main memory card is not formatted. But still create a backup. 1. First uninstall all the apps like link2sd (if u have linked any app then delete all the links) and app2sd and do a factory reset of ur phone and then connect ur memory card through acard reader or through usb cable with pc . 2. Open Minitool partition u will be able to see ur two partition. 3. Right click on the second partition( mostly the one with smaller size) and click on delete (do not disturp the first partition) and click OK now your second partition will be shown as unAllocated. 4. Right click again on the second partition and click on create and choose “primary” in create as. and “Ext2” in file system. 5. Now click OK and then click on apply on the top left corner and wait for the process to finish thats all you have created a EXT2 second partition. 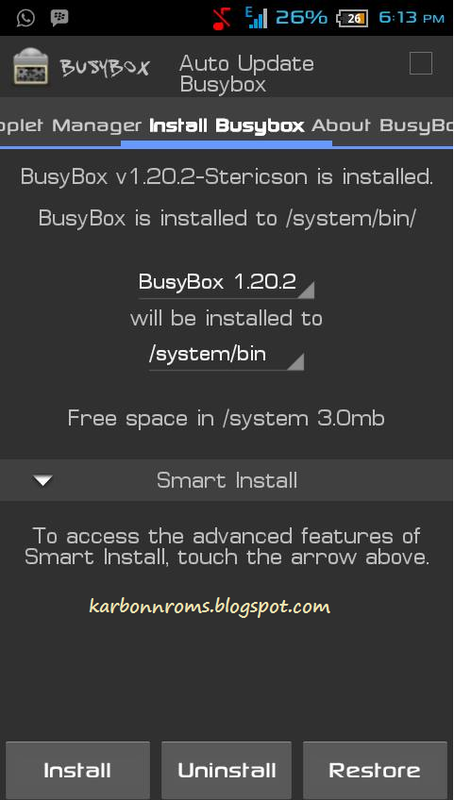 Step 3 : Install Busy box and init.d support. 1. Use this tutorial to install init.d support – Init.d. 2. Download Busybox pro from above link. 3. After installing it open Busybox, slide left side see on up it should be install busybox. 4. Under smart install it will be loading some file let them load and wait till the above screen comes. Now select ‘Install’, And then it will ask you to choose smart or normal Choose ‘Smart install’. Done ! Download and install Mounts2SD on your Android from playstore. Launch Mounts2SD. Click on the options button ( the botton left to the home button of your device) and select “Applications Setting”. Now in ‘Application settings’ select “Install scrips on start up”. and wait till process is over. Now press back now you will be on the main screen of Mount2SD. Now goto settings (the Wrench icon – it will be next to the eye icon on the top). Click on cache and enable it . Check the applications , data , and dalvik cache . ( do not select system apps) and now close the mounts2sd. NOTE : If you want to check the remaining memory of your second partition open the Mounts2SD and in “Storage” tab see the external it is your second partition. I hope this article helped you. If you have any doubt or suggestions you can comment below. Do Like & Share this post . If this method didn’t worked, you can use this method which has 100% Success rate : Increase internal memory. Wait till everything is over and your mobile is booted . Now go to “Settings > Apps” and see the internal memory. Now install any app or game and again check the internal memory. It will still be the same. How To Install Google Playstore in Any Rom. Easiest method to Increase Internal memory of Android device.